Chennai, the capital of Tamil Nadu, is a major metropolitan as well as cosmopolitan city that is situated on the Coromandel Coast. It is one of the most important cities in south India as well as in the country in terms of commerce, culture, education as well as economics. In fact, Chennai is popularly known as the cultural capital of South India. Chennai stands out in its ethnicity that is so unique that it is often a desired destination for tourism. Tourists throng the various hill stations, beaches, temples and wildlife here. Those who travel here are left mesmerised by its timeless beauty. 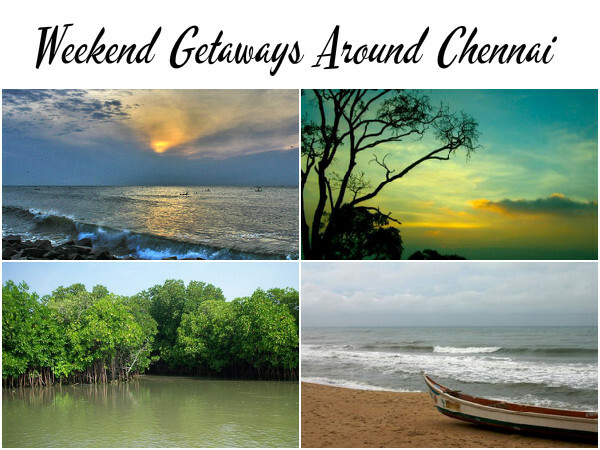 Here is a guide to some of the weekend getaways around Chennai. Get Upto Rs.8,000 OFF on Travel Coupons. Covelong, a fishing village on the Tamil Nadu coastline, serves as a true delight for beach lovers. It is close to Chennai and is the perfect weekend getaway.The Dutch Castle here has been converted into a resort and attracts a lot of tourists every year. Known by the name Taj Fisherman's Cove, it is the perfect place to stretch your legs and have a good time. Other attractions at Covelong are the temples built by the Pallava dynasty that belong to the 5th to 8th century. Located on the Coromandel Coast, Pulicat is a tiny yet picturesque seashore town in Tamil Nadu. Pulicat is best known for two things: Pulicat Lake and Pulicat Bird Sanctuary. Pulicat Lake is considered as the second biggest brackish water body in India and attracts millions of tourists every year. It is 50 km from Chennai and takes nearly 1hour 20 mins to reach here. The city of Vellore is generally regarded as a transit hub for travellers. This city has a quiet past and is not considered as a major tourist hub and is thus less explored. Those who travel through this city are smitten by its culture and traditions. There are a few places that tourists can head to in this city. The most important being the Vellore Fort, which still retains its past splendour and grandeur. It is also well known for the Ayurvedic treatments available here. Vellore has a few shopping malls where you can head to and shop as well. The temple city of Nellore located in Andhra Pradesh is today slowly becoming an IT hub. Previously known as 'Vikrama Simhapuri', Nellore is nestled on the banks of Penna river and is well known for its agriculture and aquaculture. There are many a tourist sightseeing place to visit in Nellore, including the Barah Shaheed Dargah, Mypadu Beach, Pulicat Lake, Nelapattu Bird Sanctuary, Narasimhaswamy temple, Ramalingeswara temple and more. It is 174 km from Chennai and takes upto 3 hours to reach here. The town of Pondicherry boasts of a rich legacy inherited from the French colonialism that has contributed immensely to the unique culture and heritage of the region. Travellers coming here get a feel as if they have entered a French town. It is one of the most scenic places in the country and you can see the remains of various French architecture here. The place and surrounding regions offer many attractions to be explored, ranging from unique heritage stays to beaches and ashrams. Cuddalore, situated on the coast of Bay of Bengal is one of the fastest growing cities in the state of Tamil Nadu. The name Cuddalore refers to "Sea town" in Tamil and the town is indeed abundant with beautiful beaches. The town is famous for its various Shiva and Vaishnava temples. Some of the most famous temples are Pataleeshwarar temple, Tiruvaheendirapuram temple, Mangalapureeswarar temple, Sudarkozhunthutheesar temple, to name a few. It is 190 km away from Chennai and would take 3 hours 30 mins to reach. Yelagiri, also spelt as Elagiri, is a small hill station in Vellore district of Tamil Nadu and is a back packer's paradise. Located at a height of 1048 mt above sea level, Yelagiri hill station is a cluster of 14 hamlets inhabited by the tribal folk. The Yelagiri hills are popular among adventure sports lover. Yercaud, located on the Shevaroy Hills of Tamil Nadu, is a hill station in the Eastern Ghats. Located at the height of 1515 meters, its scenic beauty and pleasant weather brings in many tourists. Yercaud is known for its plantations of coffee, orange, jackfruit, guava, cardamom and black pepper. The forests of Yercaud have an abundance of sandalwood, teak and silver oaks. From wild animals like bison, deer, foxes, mongooses, snakes, squirrels to birds like bulbuls, kites, sparrows and swallows can be found in these forests.It is a nature lovers paradise.